Androgen Receptor (AR) expression plays an important role in the proliferation of human prostate cancer and can also confer a better prognosis in breast cancer. Because of AR's critical role in cell biology, it is important to measure and compare total amounts of AR contained in different cell types and tissues. 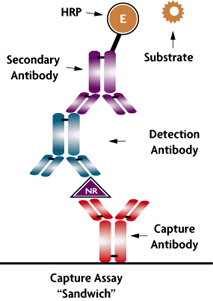 Figure 1: Monitoring protein expression levels of AR using NR Sandwich. 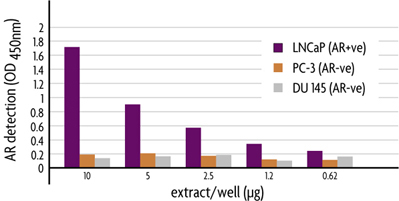 Different amounts of nuclear extracts from three human prostate cancer cell lines: LNCaP, PC-3 and DU 145 were analyzed for levels of AR protein using the NR Sandwich AR Kit. Nuclear receptors (NR) belong to a superfamily of structurally related ligand-inducible transcription factors whose members include receptors for estrogen (ER), glucocorticoid (GR), androgen (AR), thyroid hormone (TR), progesterone (PR) and vitamin D (VDR). Inappropriate signaling by these receptors is associated with numerous disease states, including cancer, asthma, infertility, osteoporosis and arthritis. Why use the Nuclear Receptor ELISAs?